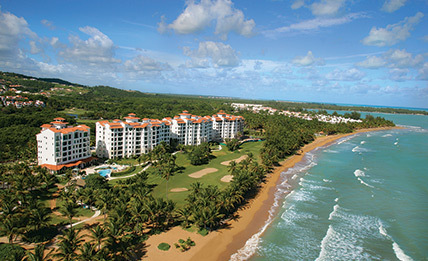 In the tropical setting of Puerto Rico, facing the deep turquoise Atlantic Ocean and the lush greens of the signature 16th golf hole of the Fazio-designed Ocean Course is Ocean Sixteen. An extraordinary beachfront, golf-front resort community located within the Rio Mar Beach Resort & Spa –a Wyndham Grand Resort. Ocean Sixteen's spacious and modern villas offer you the opportunity to live in a Caribbean beachfront property with prices now starting from $520,000, a 40 percent discount from the original price. In addition, Law 68 allows potential buyers to purchase new residences, without paying property taxes for five years, and also without capital gain taxes, among other benefits. This is your opportunity to have a resort lifestyle and a gorgeous Caribbean home at Ocean Sixteen. All villas offer breathtaking views that inspire functional, beautiful, and comfortable spaces with luxury features and finishes. Details in marble, granite and natural woods blend exquisitely to create the perfect ambiance. Adding to its beautiful tropical setting are the amenities provided by the renowned Rio Mar Beach Resort & Spa –a Wyndham Grand Resort. Over 500 acres of beautiful land host miles of golden sandy beaches, two world-class golf courses, a Peter Burwash International Tennis Center, Mandara Spa and Fitness Center, over 12 restaurants, lounges and entertainment venues, a thrilling casino, and quaint shops and boutiques. Ocean Sixteen offers 87 luxury condos located in four separate 'clusters' that are unique for its Mediterranean style architecture. These amazing villas, including the penthouse, offer amble space for living, from 1,646 to 4,145 square feet. All villas have European style kitchens with granite tops, ample master baths, marble showers and sinks with granite tops. All condos have large balconies with beachfront views, that complement the perfect setting for relaxation and family activities. Ocean Sixteen residents enjoy extraordinary recreational facilities, including an infinity pool, a kid's pool, and a spacious deck to relax and enjoy the sun. The exclusive Owner's Lounge offers a comfortable space for relaxing with a flat screen TV, pool table and bar ideal for activities, and a private wine cellar with a tasting table for the enjoyment of every resident. Another big plus for water sports' enthusiasts is that each villa has a storage area for watersports equipment. The complex offers a full capacity generator, water cistern, 24/7 security and two parking spaces per apartment. Access to Ocean Sixteen in Rio Mar is now more convenient than ever through Route 66, ending near the Wyndham Grand Resort in Rio Grande, Puerto Rico. Do not miss out on this great opportunity, come visit our sales office and model apartments. For more information call us now at 787-593-9949.